A masterfully detailed Chinesco Type 'E' female figure with original red and black painted decorations on a creamy kaolin slip. 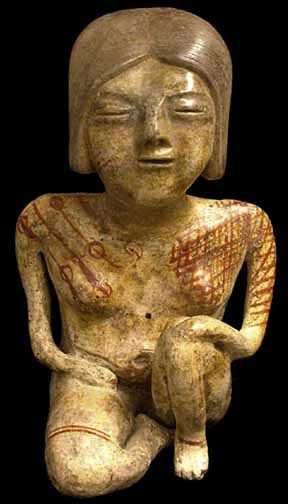 The hair is very finely incised, and the overall work is indicative of a specific ancient Nayarit workshop or individual artist who created this sub-style. Provenance: From a Tucson, Arizona Private Collection. Condition: There is some minor professional repair in the head area. This lady is in otherwise excellent condition.